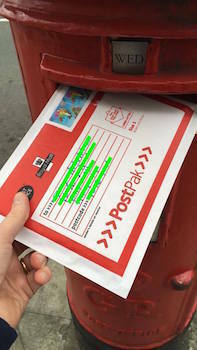 Don’t know about you, but I do like getting things in the post. So anyway. Back to that Great Giveaway. Today, I’m giving away a book that cost me £200. 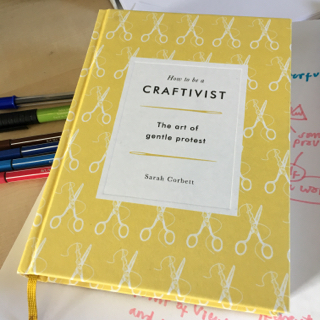 It’s just out, from Sarah Corbett: How To Be A Craftivist. Plus a couple of ace bonuses (see below). If you read my book How To Change The World, you may recall seeing Sarah’s photograph inside. She’s hanging a handmade banner across a fence, with a generally encouraging message. Since that photo was taken, Sarah has become a bit of an international phenomenon. The Nobel-winner Malala Yousafzai, and the performer / author Russell Brand both attended her workshops, learning to turn activism into something creative, or creativity into something with a social purpose. A while ago, Sarah persuaded me to join a small army of campaigners hand-stitching encouraging messages onto a handkerchief, to send to board members at one of the UK’s largest companies, M&S. The embroidered hankies were designed to encourage M&S to be brave and introduce a living wage, instead of the bare minimum. I spent quite a few days stitching a quote from Jane Austen onto a new M&S hanky. Mine was destined for the actress Emma Thompson – not a board member, but a “face” for the brand in its advertising. When the hankies were all done, we popped them into a nice box with a ribbon, plus a handwritten note. I never heard back, but Emma Thompson is a busy woman and I wasn’t expecting a reply. More importantly, the hankies were a hit with board members, who (it turns out) spent time before the AGM compared them to see whose was best). At that same AGM, Sarah was invited to speak, warmly applauded, and invited to take the discussion further. The point to stress is this: by sending something made with care, the activists got a friendly hearing. Probably wouldn’t have got a hearing at all if they’d stood outside with placards, shouting. A lesson for us all, I think. So anyway: that’s a bit of context about Sarah. I’m giving away a copy of her beautifully produced book. PLUS, as a bonus: I’ll throw in a copy of my own book Sew Your Own, in which I first wrote publicly about my sewing experiments. Well, Sew Your Own is guaranteed to make you laugh every 4.6 pages, think hard every 2.4 paragraphs, and – well, I’m obviously making this up, but I enjoyed writing it and some people have implied that it’s pretty hot stuff. If you win, I’ll draw you a pair of Y-fronts at the front, to get you in the spirit. AND as a bonus I’ll buy you an hour’s free coaching with me. Cor, I hear you say. Now, just to put this into context, an hour of one-to-one coaching with me is becoming harder to find, and also more expensive, because I’m doing most of my coaching and teaching, online, through my Academy site these days (https://academy.flintoff.org). But I like to keep my hand in, with a bit of full intensity one-to-one listening, noticing and sharing ideas. Most people want help Making Change Happen. Or Building A Movement / Audience. Many like tips on Better Communication / Storytelling. You might want something else. So: that’s quite a lot to give away entirely free. I told you I paid £200 for Sarah’s book. Sarah crowd-funded her book, just as I previously crowd-funded my novel, What If The Queen Should Die? Now our books are distributed by Penguin Random House (oh yes). When she launched her funding drive, I immediately bought the most alluring offer – a handsome hardback PLUS the promise of a custom-made work by Sarah. Something she would stitch just for me. At the time, I had no idea what exactly she’d make. Some kind of generally encouraging slogan…? But now I realise I want something specific. Something to help me focus on what I do best. And it’s very hard for me to see what that is. To stand a chance of winning these books, and your pre-paid coaching session, just hit reply now, with a short sentence for Sarah to stitch, describing what I do best. But when it comes to this short sentence, the judge’s decision (that is, mine) is final. While you’re at it, tell me ONE thing you would most like to work on if you won the coaching session. PS.> Yes, I’m serious! Go ahead and leave a comment below. 1. What short sentence should Sarah stitch, for me to stick on my wall as a reminder of what I do best? 2. And what ONE thing would you most like to work on if we did some coaching together?